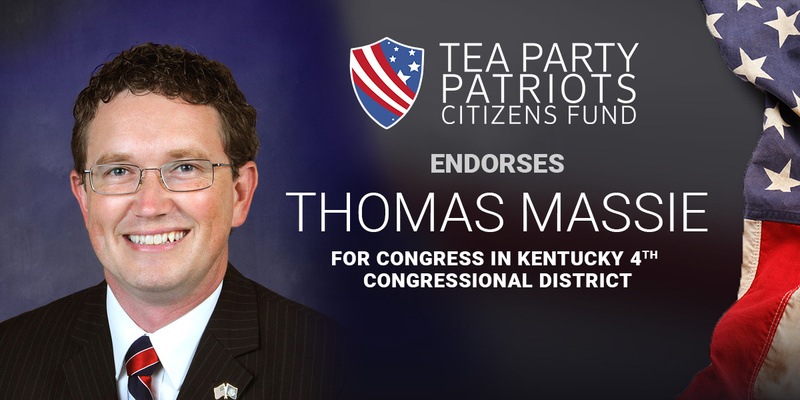 ATLANTA, Ga. – Tea Party Patriots Citizens Fund (TPPCF) Chairman Jenny Beth Martin today released the following statement, announcing that the Super PAC associated with the nation’s largest Tea Party group has endorsed Thomas Massie for reelection to Congress in Kentucky’s 4th congressional district. “When it comes to standing up for conservative principles and refusing to back down, even under heavy pressure from the so-called ‘leadership,’ conservatives in Kentucky and around the country know they have a champion in Congressman Thomas Massie. “As an inventor and entrepreneur, Thomas knows first-hand how government’s heavy hand can retard innovation. Consequently, for years he’s led the fight to provide stronger protections for intellectual property. “Thomas fights for tax cuts to create economic growth and better and better-paying jobs, and he fights for spending cuts to shrink the size and scope of the federal government. “Whether it’s standing up for the Second Amendment, or fighting to repeal ObamaCare, or insisting the federal government only spend money on programs that are Constitutional, Thomas Massie has represented his constituents well and ably.